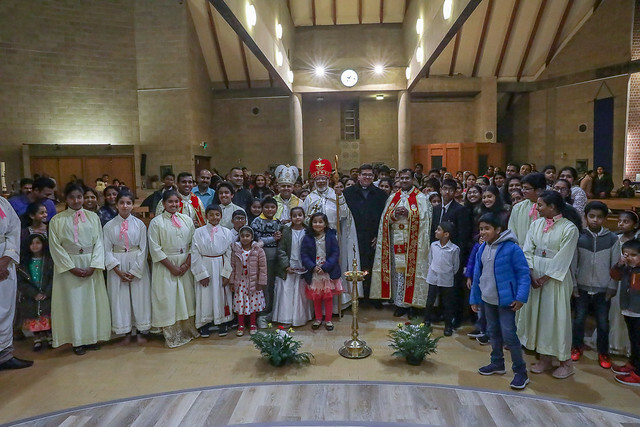 His Beatitude Mar George Cardinal Alencherry, the Major Archbishop of the Syro-Malabar Catholic Church, inaugurated the St. Joseph’s Syro-Malabar Mission at Coventry, UK on 26th November 2018. The celebrations were held at Sacred Heart Catholic Church, Coventry at 5.30 pm. The newly erected Mission encompasses the existing Syro-Malabar Qurbana (Holy Mass) centres at Coventry and Nuneaton. His Excellency Mar Joseph Srampickal, the Eparch (a term used for Bishop according to the Code of Canons of the Oriental Catholic Churches)of the Syro-Malabar Eparchy (diocese) of Great Britain and Msgr. Timothy Menezes, the Vicar General of the Archdiocese of Birmingham were present. Rev. Dr. Sebastian Namattathil, Director of the new Mission, welcomed all in the beginning and Rev. Fr. Jiji Puthuveettikalam SJ read the decree of establishment of the Mission. The Major Archbishop handed over the decree to the Director and lighted the lamp together with Bishop Srampickal. The Pontifical Qurbana was presided over by Cardinal Alencherry and during the homily, the Major Archbishop encouraged all the faithful to practise and protect the Syro-Malabar spirituality and tradition. The declaration of the mission envisages Holy Qurbana and catechetical formation on every Sunday and easy approachability of the Syro-Malabar faithful to its own sacraments and sacramentals. A great many Syro-Malabar faithful came to the ceremonies and they had opportunity to interact with the Major Archbishop and the Bishop after the liturgy. The leadership of the kaikars of the Qurbana Centres and the prayer unit leaders helped the ceremonies to conclude smoothly. The function ended by 8.00pm with tea and snacks for all the participants.